Single-family house "this property". In an elevated position, 1.5 km from the sea, 1.5 km from the beach. Private: well-kept garden 3'400 m2 (not fenced) with flowers and trees. 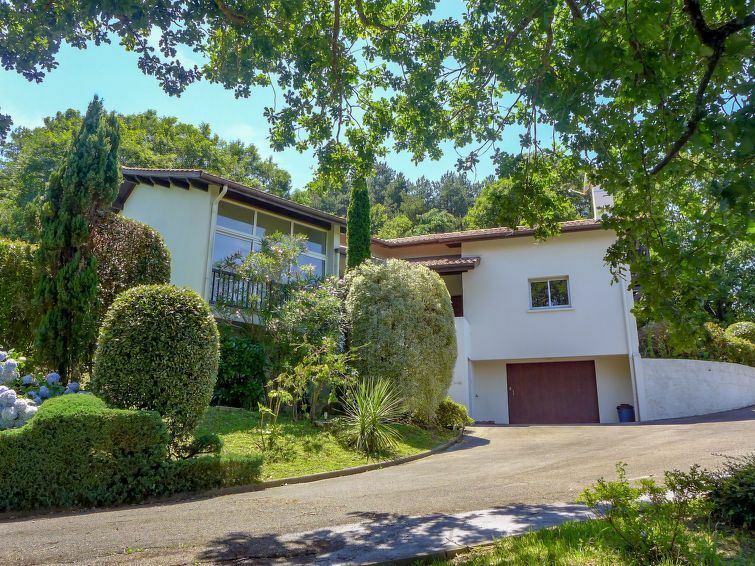 Shop 500 m, grocery, supermarket, shopping centre 200 m, restaurant 1.5 km, bar, bakery 200 m, café 500 m, railway station "Saint jean de Luz" 3 km, sandy beach "d'Erromardy" 1.5 km, park "Ducontenia", thermal baths "Hélianthal" 3 km. Sports harbour 4 km, golf course (18 hole) 4.5 km, surf school 3 km. Nearby attractions: Jardin botannique d'Erromardy 1.5 km. Hiking paths: La Rhune 9 km. Please note: the keys‘ handover takes place by the agency Interhome à 16h, à 1 km. Main road close by. the highway is at 500m. 4-room house 154 m2. Spacious, comfortable and beautiful furnishings: large living/dining room with TV (flat screen). Exit to the terrace. 1 room with 1 french bed (160 cm), shower/WC and double hand-basin. Exit to the balcony. 1 room with 1 french bed (140 cm). Exit to the balcony. 1 room with 1 french bed (140 cm). Exit to the balcony. Kitchen (oven, dishwasher, 3 ceramic glass hob hotplates, microwave, freezer, electric coffee machine) with small bar. Bathroom, bidet, sep. WC. Upper floor: with 2 sofabeds (80 cm), library and TV (flat screen). Exit to the balcony. Shower/WC. Electric heating. Large terrace 170 m2, south facing position. Terrace furniture, barbecue, deck chairs (6). Distant view of the ocean. Facilities: washing machine, iron, baby cot, hair dryer. Internet (WiFi, free). Reserved parking (4 cars). Please note: smoke alarm. Please note: The 2 sofa beds (_àcm) are in a Mezzanine.